"Part jeremiad, part gripping crime thriller,"* Don't Shoot is David M. Kennedy's chronicle of his decades-long crusade to solve one of America's most pressing and shameful social problems. Kennedy, who engineered the "Boston Miracle" in the 1990s, cutting youth homicide by two-thirds at the height of the crack epidemic, reveals the history and the strategy behind his commonsense yet revolutionary approach to ending crime. He has refined an approach in which everyone-gang members, drug dealers, cops, and neighbors-comes together in a giant community meeting, an intervention and an affirmation of a shared desire for safety and peace. The proof is in the miraculous results. 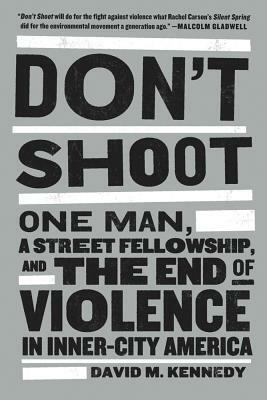 Don't Shoot offers a bold way forward in combating one of our country's most intractable social problems. David M. Kennedy is the director of the Center for Crime Prevention and Control and a professor of criminal justice at John Jay College. Kennedy has received two Webber Seavey awards from the International Association of Chiefs of Police, two Innovations in American Government awards from the Kennedy School of Government, and a Herman Goldstein Problem-Oriented Policing Award. His work has been used as a model or source for safety and drug intervention initiatives by the Clinton and Bush administrations, and by the Bureau of Justice. Kennedy lives in Brooklyn, New York.